Typically, women were the main ones who practiced seidhr. Volva was the term given to the women who traveled and taught/practiced seidhr (specifically oracular seidhr). The term volva can mean a variety of things: “staff barer” , “soothsayer”, “seeress”. These women were not associated with any clan, or specific lineage. They often lived isolated, and would travel to and from villages to do seidhr work. It was typical for these women to travel, sometimes in groups, to various towns and villages. Essentially, the leader who practiced seidhr would sit atop a seat and if she was accompanied by others, they would begin galdr, or the singing of spells (calling the spirits, etc) and weaving of songs to put her into an altered state. During this, the volva would “fall into a state of ecstasy” by trance-work or similar means. While in this state, the one practicing seidhr would seek answers to questions through a sort of divination with the spirits, the deceased, etc. In Erik’s saga, there is a description of what most of these women wore. “Animal skins: including boots of calkskin and gloves of catskin”(Paxson). It is also common to see these women depicted as carrying a staff in their main hand. Hence why they were sometimes just called “Staff-barer”. The staff itself was important, as it was seen as a “rod” that channeled some of the energy needed to work Seidhr. It is also said that is was sometimes customary for a sacrificial/offering meal to be made for her using the hearts of any living creatures that were available at the time of her visit. “Snorri tells us that she (Freyja) taught the craft of Seidh to the Aesir.”(Paxson) and it is thought that Freyja was Priestess to the Vanir. Because Odin, at one point, shows that he knows Seidh magick- it is thought that Freyja was the one who originally taught it to him. More evidence for Freyja being the one to teach this type of magick: the volva that I mentioned seen in Saga of Erik the Red is wearing clothes made from catskin, which is a sacred animal to Freyja. She is seen as a mentor to some who seek guidance in learning Seidhr, so it is common for women learning this to cover themselves in gold, amber and other jewelry (some prefer cat symbols in their jewelry). *I will be largely avoiding oracular sedihr, as that would take far too much time to discuss. I’m keeping this very basic. Seidhr is seen to be similar to shamanic practices from other cultures, and often involves things such as altered states, trance-work, divination and many more. It is a type of magick that rarely dealt with the runes at all. Instead, it was more centered around the spiritual aspect of things. Most commonly you will find mention of it throughout the sagas such as Saga of Erik the Red, Heimskringla, etc. It is mentioned once as being a power Odin possessed. There are three basic pillars to Seidhr. 2)The second pillar is the soul-travel that is done after the trance is achieved. This is where the “bulk” of all the working is going to be done. Soul travel is also known as faring-forth, sitting-out, pathwalking and journeying. During this stage, a lot of different things occur- which is why this stage is important and probably the most complex to explain. “Soul travel is related to divination so shall now be considered in more detail. Shamanic traditions work on the basis of different levels of reality: the consensual, everyday reality and the other world/s. The World Tree appears in most shamanic cultures and acts as the axis-mundi, or centre of the universe, connecting the different worlds and realities. In the Northern Tradition, the horse has related symbolic meaning, representing a means of transport to the other world (the shaman being the rider). Similarly the world tree is called 'Yggdrasil', or Odin's steed.”(Richardson) In a sense, “soul traveling” is “climbing” the World Tree, or traveling the threads connecting the realms. Once you’ve directed yourself to where you need to be for whatever type of working you intend to do, you can begin right away. Some use this state for healing (whether it be the healing of ones self or of another person.) It’s been said that sometimes the first time a new shaman enters this stage of Seidhr they can awaken “Shaman Sickness”. “The term denotes a period of illness (often seriously life-threatening in some way) which is caused by the Gods and wights in order to completely remake someone and turn them into a shaman. The phenomenon of shaman sickness is found in tribal cultures around the world, with remarkably similar sets of traumas. 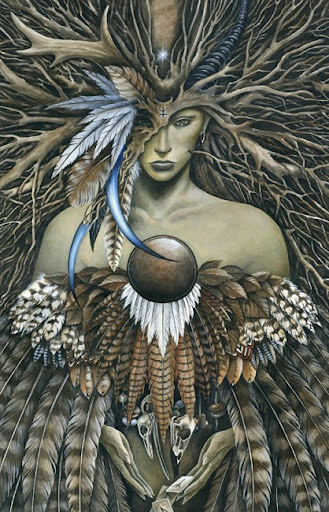 It is the hallmark of the classic shaman in many parts of the globe.”(Raven K., keep in mind we are using these terms under a Northern-Shaman approach). Healing can also be approach for other reasons, including healing of the soul. There is such a thing as a “soul map” in these traditions that is a divinatory chart. Different parts of this map represent different parts of the soul and the body, and is then used to “divine” via runes and stones. During the state of seidhr, this would be an ideal time to seek answers to problems the person you are working on is facing from a health aspect. Providing I have time I’ll write an article on hyge-craeft, which is essentially “craft” work with the soul. During this stage you may work with your spirit guides and animal totems. We refer to our animal totems as our animal fetch. Sometimes certain animal fertches may be called: fylgja. These are the animals/creatures that accompany us throughout our entire life. This animal conforms and molds to the person’s personality, and it is believed that our well-being depends on the well-being of our animal fylgja. (Be careful, sometimes fylgia is a term that refers to a female spirit that is attached to a person throughout their life as well, hence why I support using the term “fetch” to differentiate the two!) “In Scandinavian folklore, each person has an animal shape which follows him like a shadow and can be seen by the second-sighted (although what is seen may be the hamingja, see below). I’ll go more into this idea by itself in a separate article. There’s just too much to write for now. Another thing that is done, though not commonly, is spirit possession. During this part of seidhr you open yourself up as a vessel to let a deity/spirit work through you. You become “the horse” and the deity “rides” you. There are different purposes for this: 1) Training/Practice 2)Gaining information or knowledge 3)Display of devotion 4)Errands for the deity 4)Becoming a channel. (Raven K). I am just now starting to learn and practice this path, so bear with me-as I have not yet figured out some aspects of it. 3)The third pillar is rhythm. This pillar is apparent from the start through the entire process of seidhr. Often, the most common rhythm used for this type of work is Sleipnir. Sleipnir is the magickal horse of Odin, which is said to have glided between realms upon the web known as Wyrd. This is fitting, considering Sleipnir is often depicted as having eight legs, like a spider. In shamanistic practices, the rhytm of the drum is the Sleipnir: "Sleipnir is like the galloping of the shaman in his journey, the constant sound of his hooves is like the rhythm of the shaman drum, in which he journeys to the other side searching for protection and knowledge, from the spirits and ancestors, sleipnir alludes to move fast, and to everything that escapes the fiscal control, like climbing the world tree of Yggdrasil into other realms, other worlds, the great journey, riding in a altered consciousness." This beating of the drum is used often to help the shamans go into their trances. Other rhythms can be used as well, so keep that in mind. You want a rhythm that is easy to focus on and one that will help narrow your focus.